The cockpit of a Boeing 787-10 Dreamliner. Bloomberg photo by Ore Huiying. That poorly ventilated conference room isn't the only place with the potential for sick-air syndrome. The first-of-its-kind research suggests that current regulations aren't adequate to assure there's enough fresh air in airline flight decks and raise questions about whether even moderately elevated carbon dioxide levels could impact safety, said Joseph Allen, an assistant professor at Harvard's School of Public Health and lead author of the study. "It's clear that the air quality in the cockpit can have an impact on performance," Allen said. 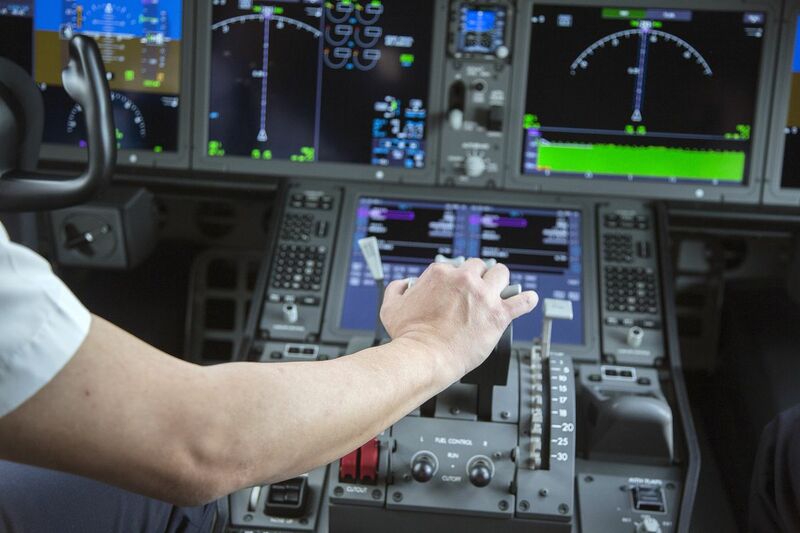 "It's clear we haven't been thinking about it too deeply in terms of the impact on pilot performance. Now that we know, I think we're obligated to ask those next sets of questions and really understand it." In recent years, studies have shown that even an increase of a few hundred parts per million of carbon dioxide in the air we breath causes people to test lower for cognitive skills. But until the latest study, pilots and airline cockpits hadn't been examined. Thirty airline pilots were recruited to fly multiple three-hour segments in a special flight simulator in which carbon dioxide levels could be manipulated. Performance on 21 maneuvers — ranging from making a steep turn to handling an emergency engine fire — decreased as carbon dioxide levels rose, according to the study. Flight examiners certified by the Federal Aviation Administration rated the pilots' performance. Allen took pains to say that air travel is extremely safe. There has been only one passenger death on a U.S.-registered airline in more than nine years and there's never been any evidence linking routine carbon dioxide levels to a crash. "The goal is to optimize conditions for a safe flight," he said, "and the air in the cockpit has to be a part of that conversation." According to the limited data available, the air in most aircraft is below that ceiling. But there are indications that carbon dioxide can spike. Tests of air in aircraft passenger cabins show carbon dioxide levels typically climb to 2,000-2,500 parts per million during loading and unloading, when a plane's ventilation system is operating at lower capacity. "There's virtually no information on the air quality in the cockpit. It's the one place where it seems we really would want to know about the most," Allen said.